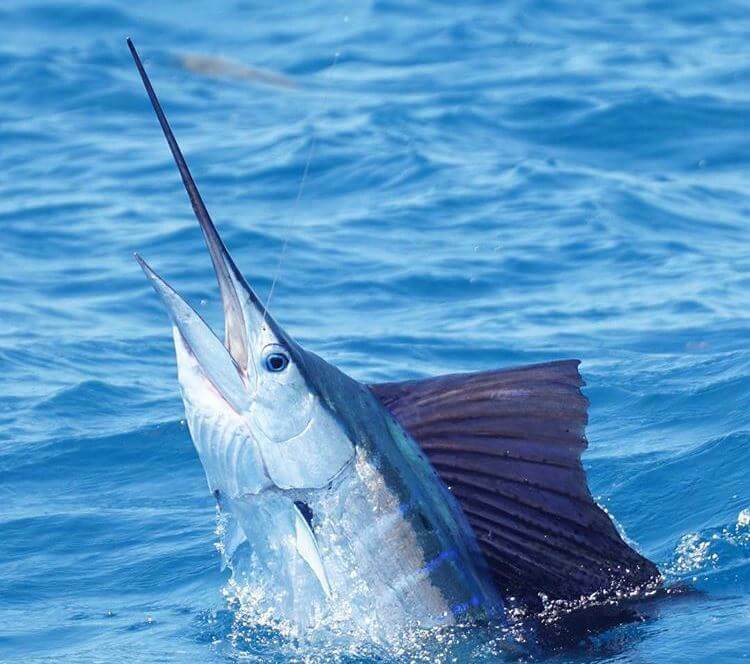 Any serious fisherman in south Florida is going to be flying kites this winter for sailfish. In order to do so, you’ll have to make a kite line. The basic kite line uses three different “marks” used to stagger three kite clips. 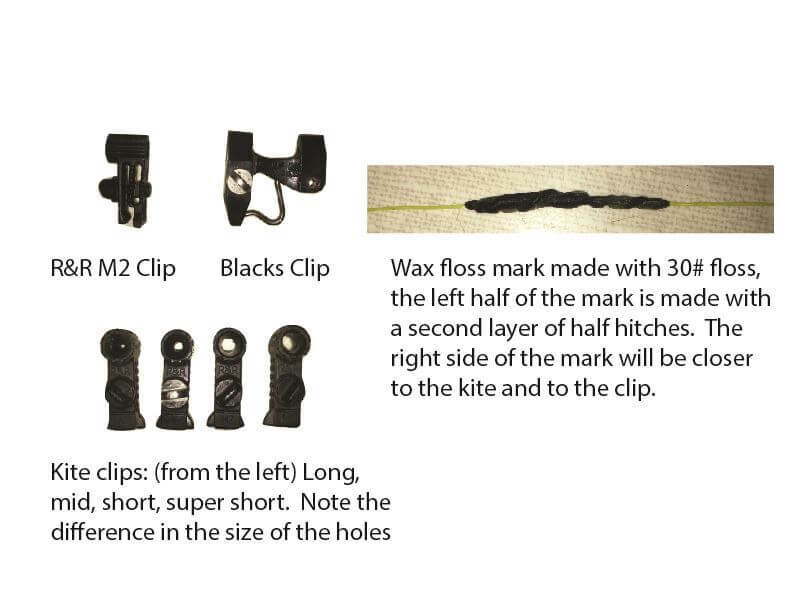 This is established by having different size holes in each of the kite clips, each corresponding to a mark on the kite line.What do you mean by a “mark”??? The mark can be a swivel or a floss mark made with wax floss tied in a series of half hitches. The marks are designed so they are slightly larger than the hole in the kite clip. As the kite is sent away from the boat, the mark on the line leaves the reel and catches the kite clip. 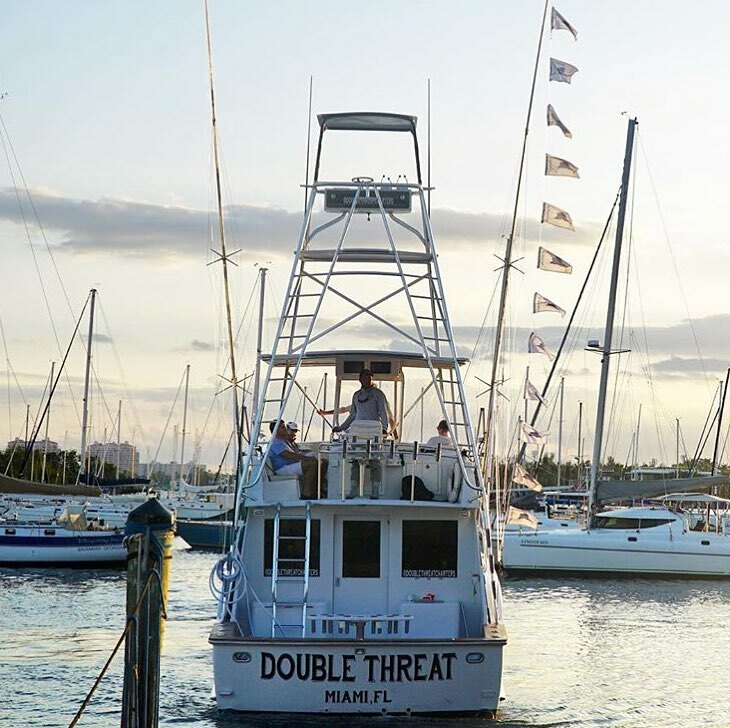 Most fishermen use a 3-clip system and refer to the marks as the “long”, “middle”, and “short” marks. The clips have different size holes with the smallest holes on the long clips (closest to the kite) and the biggest holes on the short clip (closest to the reel). Kite marks should correspond to the diameter of the clip. The long mark will be the furthest from the boat, and the short closest to the boat. It’s also possible to run a 4th clip and we often do so, even with inexperienced anglers.There are several different methods to make marks to stagger your kite clips. The easiest way is by attaching your braided line segments together using swivels. This method works great for recreational anglers. Unfortunately, putting 3 swivels on the kite line breaks the line up into segments into with 6 knots (one on each end of the swivel). These knots are a weak point when they begin to experience a lot of stress. Another method for creating kite marks is with the use of wax floss, which are more durable than swivels because they keep the line intact. Charter fisherman and tournament fishing teams typically prefer wax floss because of the added durability and ease of use. Wax floss is tied around the kite line with a series of half hitches. A double layer of wax floss prevents the clip from sliding past the mark. The furthest floss mark will have the fewest overlapping half hitches and the closest floss mark will have the most. Always size the marks with the corresponding clips. There’s no rule regarding how far apart you should space your kite clips. 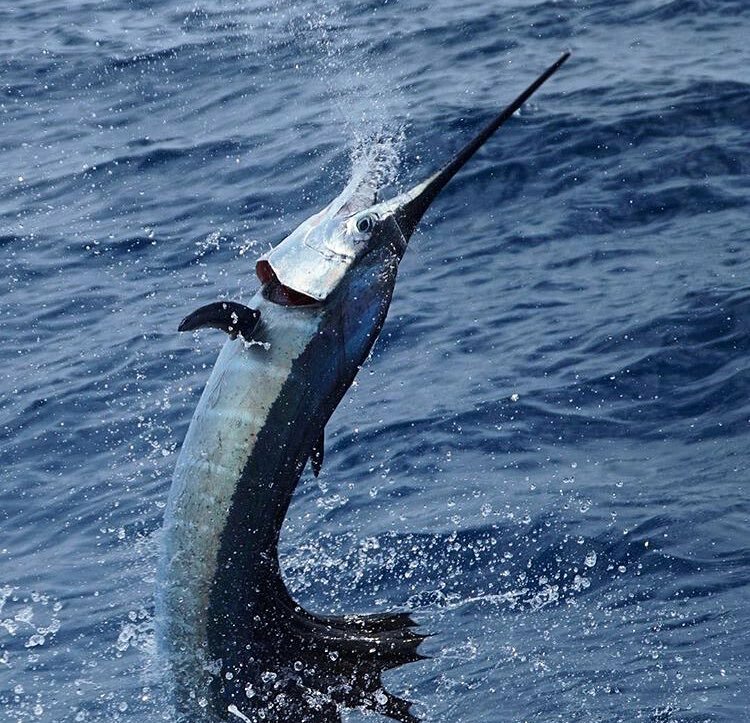 Some anglers prefer their baits and clips closer together and will rig their kite marks as close as 40 feet apart. I prefer to fish clips positioned in the picture below. This distance will give you a big spread, but are close enough together to allow a pack of fish to spot multiple baits in your spread for multiple hookups. 70 feet from the short to the super short (here I opt for a swivel). How high should your kite fly, can it be too high or too low? Yes, try to keep your kite around a 20-25 degree angle above the water. The reason for this is that below 20 degrees, the kite line will be too close to the water to allow you to reel the short bait up in the air. 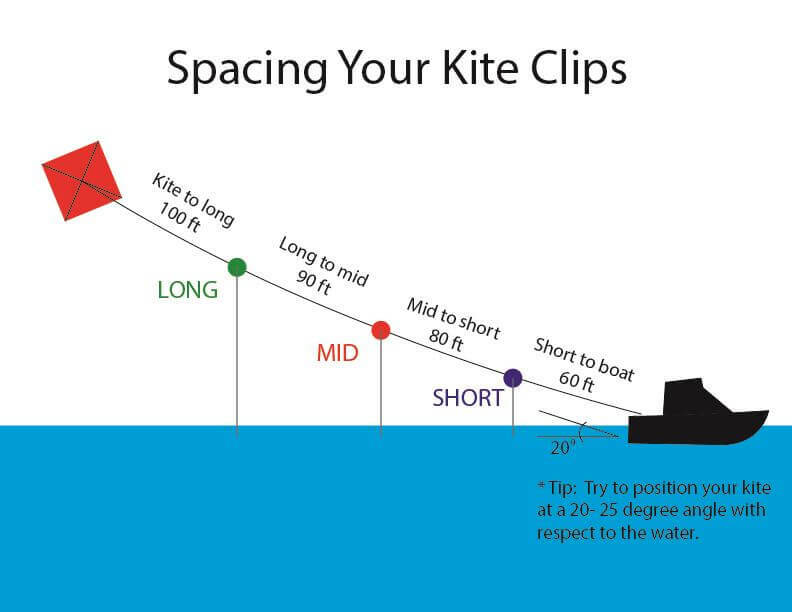 This will prevent you from avoiding tangles, checking the bait, and shaking off weeds stuck to a bait.If your kite is flying too high, the distance between your baits is decreased due to geometry. Additionally, this means more line needs to come off the reel to keep a bait in the water when compared to a kite at a lower angle. This means a longer drop back when the clip pops. Furthermore, more air resistance on your main line means it will require more lead to keep the bait from being pulled out of the water. Another tip is to use a lighter wind kite than the wind conditions call for. For example, (we fish with SFE brand kites) suppose the wind is 14 mph. This speed falls within the manufacturer rating for both its light wind (4-15 mph) and all-purpose (5-25 mph) kites. By flying the light wind kite, there will be more tension on the kite line, helping to keep it straight and from sagging. This will also help when maneuvering the boat with the wind.